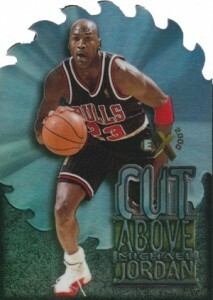 Few products incapsulate the mid-to-late-1990s in collecting better than 1996-97 Skybox E-X2000 Basketball. 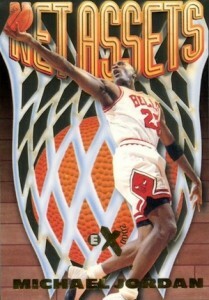 Featuring futuristic base cards, limited parallels, exciting inserts and even autographed cards, 1996-97 Skybox E-X2000 Basketball had it all. Although it is certainly not a vintage product, the sensitive nature of the base cards has only been amplified over time. High grades are tough to come by and the cards are easily damaged. The base design is reminiscent of a previous Skybox insert, 1995-96 Hoops Skyview. Containing a frame border and die-cut image of each player, a transparent plastic sheet, decorated with clouds, is the primary background. The bulk of the product is comprised of 80 base cards, and 82 if you include the checklists. 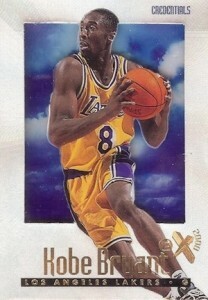 Base cards for some of the top players are available, including Michael Jordan, but the main draw is the 1996-97 NBA rookie class. 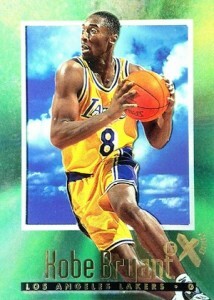 Headlined by Kobe Bryant, Ray Allen, Allen Iverson and Stephon Marbury, collectors have plenty of rookie cards to chase. The only top rookie name missing from the base checklist is Steve Nash. It may seem unlikely today, but there is actually only one base parallel. Credentials, numbered to 499, features a pearl foil border and are noted as "CREDENTIALS" on the card front. These rare parallels have produced some of the biggest values from the product. The remainder of 1996-97 Skybox E-X2000 Basketball includes the various inserts. A Cut Above (1:288 packs) employs a die-cut buzz saw design on a 10-card insert. The famed Autographics set made it's debut in 1996-97 and the 95-card checklist was included across Fleer and Skybox products throughout the season at 1:72 pack odds. Net Assets are found around one per box, and include 20 cards that mimic the look of a basketball net with a detailed die-cut design. 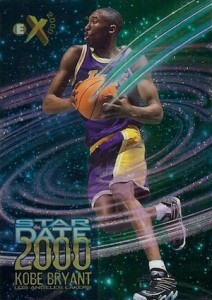 Lastly, Star Date 2000 looks to the future with 15 players from the rookie class, including Kobe Bryant. These are the most common inserts, dropping 1:9 packs. 1996-97 Skybox E-X2000 Basketball Hobby boxes include 24 packs and two cards per pack, sandwiched between blanks or an occasional checklist card. Sealed boxes are fairly rare, and prices generally sit in the $200-$300 range. 1:72 packs. View complete guide and checklist here. 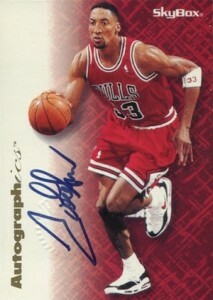 The cards are found throughout 1996-97 Fleer/Skybox products. They are listed alphabetically as they are not numbered. 1997 Fleer Skybox EX 2000 Factory Sealed Football Hobby Box VHTF!